Basically, I needed to blog because it’s driving my poor husband crazy that I haven’t. So here we go. Tooting my own horn is something I’ve never been particularly good at. But I’ll do my best. There’s lots of exciting news on the WITH OR WITHOUT YOU front. First, I was notified that WOWY has been nominated for TeenReads’ Teen Choice Book of the Year. Great to be on a list filled with such auspicious names. For a list of all the nominees, go here. If you feel so inclined to vote for me, you can do so here. 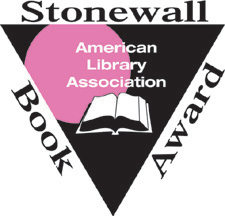 WITH OR WITHOUT YOU was named a 2012 Stonewall Honor book by the American Library Association. Next came the announcement that WOWY was named a Stonewall Honor Book by the American Library Association. Totally stunned by this one. I was sitting in the audience at the Youth Media Awards in Dallas when this was announced and didn’t see it coming from a mile away. I don’t think it properly registered for quite some time. And finally, I learned that WOWY is a finalist for the Minnesota Book Awards in the Young Adult category. A panel of astute judges (doesn’t hurt to kiss up) will be deciding the winner of this award. However, they’re allowing the public to pick a Readers’ Choice book from all nominated titles. Starting in March, you, the astute public (again, kissing up) can vote for your favorite book from the 32 finalists. When the time comes, I’ll post a link. In case, you know, you want to vote. For a book. Not that you have to. But, you know, if you wanna. So that’s about all the excitement I can bear for a while. And certainly all the horn tooting I can muster. There were so many amazing books published last year that were eligible for all these honors. It’s been a bit overwhelming to find myself in the spotlight. Thanks to all who have sent their congratulations and good wishes. I’ve been humbled by your incredible kindness. I really appreciate the support! Might be laughing about this for some time.